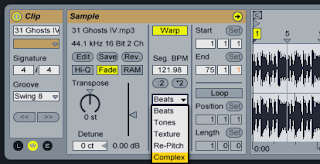 Attention DJs (or anyone warping long audio or entire songs): Turn on "Complex" warping. Sometimes I notice a tiny stutter when warping long pieces in the "Beats" mode. It sounds like the program is trying to re-correct the warp on every 16th note. Switching to "Complex" mode removes this problem.